The Avis car rental office certainly has, the Chef de Gare being called upon to process our documentation and release our pre-booked hire car. It has been a diverting past time during the train journey to embark upon a spot of car-rental bingo, but in this case our guesses are some way off the mark. While I had suggested a Citroen C3, my companion was equally certain of a Polo. We were both therefore surprised and somewhat relieved to have been handed the keycard for a Renault Clio. The current generation Clio was (by a significant margin) last year’s top selling B-segment hatchback across Europe. Indeed, since its introduction, the current model’s year on year sales continue to grow exponentially, so the fact that a car no longer in its first flush of youth is capable of such a strong showing some five years into its lifespan is no small achievement in the current febrile trading environment. For a model first launched in 2012, the Clio has maintained a visual freshness which often rather quickly fades from cars in this most hotly contested sector. In receipt of the most subtle of facelifts in 2016, there remains an essential rightness to its form which renders much in the way of plastic surgery both unwelcome and needless. Certainly, one must search carefully for obvious signs of the surgeon’s scalpel. And while one could suggest an element of skewed priorities in the Clio’s style, one perhaps ought to applaud Renault’s designers for offering their customers something that little more visually indulgent. Because if one could criticise any aspect of the Clio IV’s shape, it would be to observe a certain essence of form over function; a sense that for Laurens van der Acker and his design team, matters of aesthetics over-rode the more tedious practicalities. The car’s voluptuous shape, with its expressive and elaborate headlamp units, long wheelbase, teardrop (of sorts) shaped DLO and broad haunches is distinctly feminine in character, yet falls pleasantly short of being fey. There is a welcome lack of excess too, in the manner in which the car’s surfaces have been handled, and while the graphics are a little showy in places, they have not been allowed to overwhelm. Like all the more successful of the van der Acker-inspired Renault designs, the Clio is more of a monospace in essence, if not quite in execution – a body style with which Renault’s current design chief appears to be at his happiest – if the current Scenic and Espace designs are any guide. With 2018 looking as though it will mark the Clio IV’s strongest sales year yet (if the second half performance equals the year to June), it’s clear that the car has plenty of life in it yet. Certainly, to these eyes, it still looks fresh. Matters are slightly less successful within the cabin however, where style and substance are in places engaged in an somewhat uneasy state of mutual discomfiture. At first glance the Clio’s interior offers an inviting environment, but the profusion of unpleasantly tactile plastics in obvious and frequently encountered places (the tops of the door cards in particular) detracts from the pleasure. Stowage space isn’t a particular strong point either, there being little space for the detritus one tends to accumulate when travelling. Also unpleasant to behold is the Clio’s infotainment ‘stack’, a curiously shaped and unpleasantly finished receptacle for the car’s sat-nav screen and (in our Clio at least) manual heating and ventilation controls. However, the more driving-focused controls accorded no comment at all, from which I can reliably conclude that they worked just fine. However, one egregious consequence of car’s sinuous external forms is manifested by its severely compromised outward visibility, especially to the rear of the vehicle. Reversing was very much a matter of instinct, experience and some trepidation. Forward vision was also quite noticeably impeded by the vast A-pillars – a likely consequence of the Clio’s class-leading passive safety credentials. The feeling of grim confinement within the (otherwise decently spacious) rear of the vehicle was further underlined by the dreary all-black interior trim of our rental car. Our Clio was powered by (we believe) the lower spec version of the Renault / Nissan 1.5 litre dCi turbodiesel, producing 89 bhp. It surprised by being a good deal livelier than such modest figures might suggest, with strong acceleration and impressive power within its narrow working band. But while Autocar described the power unit as being “so refined, you’d struggle to tell that it’s a diesel,” our impressions left little doubt. Not that the noises were altogether unpleasant, there being a rather amusing induction growl emitted under spirited acceleration. The Clio handled and rode the largely rural French roads we traversed during our sojourn in the Loire with poise and decent compliance. The ride quality was firmish, well damped and body control was very well checked under most conditions. The electric power steering was direct, nicely weighted and while it offered no discernible feedback, (what does nowadays? ), it was entirely acceptable. While we didn’t quite corner the Renault on the doorhandles, the Clio was driven in a moderately spirited fashion (one of our party was a native) and acquitted itself well. Control weightings, while on the light side, were positive, linear and offered no unnerving surprises. Luggage space for three lightly-travelling adults wasn’t particularly generous within the Clio’s boot, but nevertheless, we squeezed everything in without much compromise. The rear parcel shelf however, a cheap piece of moulded plastic appeared as though it would give up the uneven struggle within a matter of weeks in more hamfisted rental hands than ours. The sweltering Sunday evening was no livelier at la Gare de Tours as it had been two days earlier, but as we awaited our return TGV to arrive from Paris, I reflected upon our rental steed. Having largely dismissed the Clio as being largely a style statement with little by way of depth or lasting appeal (apart from competitive pricing), it was with some surprise and no little contrition that I found myself considering a car of real ability and some palpable charm. A far more pleasant car than I had imagined, the Clio carried within it a hint of the relaxed loping gait which has characterised the better products of Boulogne-Billancourt for decades. What let the side down were some minor interior material grumbles, and outward visibility which ran the gamut from poor to abysmal. That the Clio Sports Tourer not only obviates this frankly unacceptable deficiency while being even better looking than the (admittedly cheaper) hatchback only places the later in an even less flattering light. If Renault saw fit to import it, this would be DTW’s recommendation. The French press are already speculating upon the Clio’s replacement, said by them to be an evolutionary design slated for launch in about twelve to eighteen months time. And while there is clearly some work to do to improve the next generation car, the current Clio nevertheless seems, on the surface at least, to be ageing with some aplomb. Author’s note: The article has been amended to reflect errors in the original text. Last year I had one of those as a rental car during holidays in Croatia. If anything, it’s definitely not an example of form following function because you can’t see out of the thing and you can only guess where its corners are, something that’s absolutely annoying in the tight environments of Mediterranean mountain villages and something absolutely unforgivable for a French manufacturer. It’s also horrible to drive because you have to thrash the living daylight out of the engine (100 hp fuel in our case) that has no torque and is utterly unwilling to rev at the same time. The 1.5 turbodiesel is my driving instructor’s car and thus the car I have done most of my motoring in. At the moment I prefer the Clio’s clutch to my own Fiesta’s, but find the Renault’s handbrake to be worse than the Ford’s. One thing that surprised me was that I really like the Clio’s large digital speedometer. I was expecting to prefer a dial because you don’t have to read it as such, but I haven’t found it to be an issue. Other than sometimes having to crane my head to see around the A pillars I haven’t really noticed the poor visibility, but then again I had nothing to benchmark it against. I didn’t much care for the shape of these when they first came out, what with their frontal aspect that is mainly headlights, but it’s really grown on me over the past few years. It must be a good design. It’s a shame they don’t make a three door, as it would avoid the absolutely pointless vestigial tiny windows behind the rear doors. On holidays in Sicily recently I was disappointed to be handed the keys to a Fiesta (MkVII, not even the latest version) when I could see there were a few brand new Nissan Micras on the rental company’s car park. I was really curious to try the Clio’s cousin but I doubt I would have enjoyed it as much as the Ford. I’ve always liked the Fiesta , which is more than I can say of the various Renaults (mostly Clios or Twingos) I’ve driven over the last twenty years. Visibility is particularly bad through the rear window where there is more blacked out area than transparent glass. Without the front and rear cameras some situations on narrow mountain roads would have been pretty sweaty,something that should not happen in a car that small. When I had my first Alfa 156, the car that started the whole hidden door handle fashion, I reguarly had passengers telling me they could see the door but no handle to open it. This Alfa was the only car that really looked better with these door handles. Nice image. Where is it from? The Clio has aged well – I like the Zoe, too, but I think that’s by a different designer. 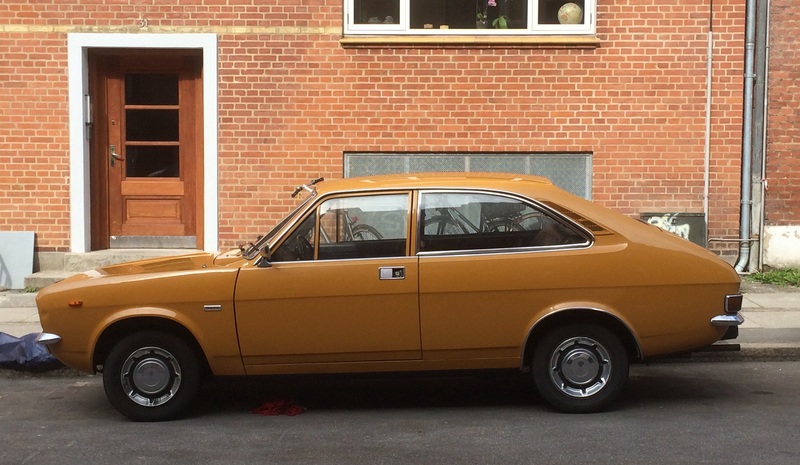 Re the door handles, I can see their problem – where would you put one on the back door? The handle’s natural place is taken up by curved metal. I agree with your point, though – I’d prefer it if they put the front door handle in the B-pillar and had no handles showing in the metal parts of the doors, assuming that regulations would allow that. One other thing – that bolted sill join (if that’s what it is) looks really odd. Merci, ami teuton. Bises à toi aussi. 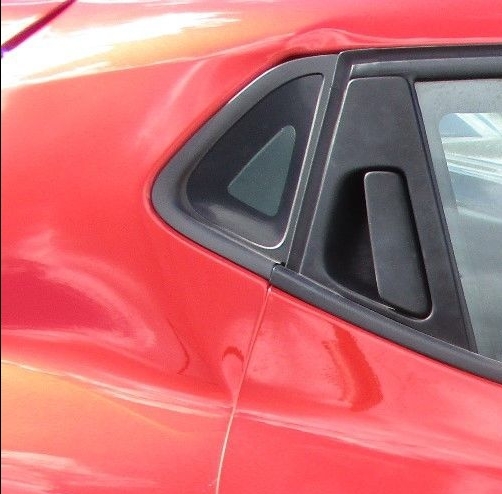 For me, a further stylistic idiocy on this, and I think some other current Renaults is where, at the bottom of the doors, the panels have a random shape ‘scooped’ into them, with a black plastic insert – and then a piece of brightwork set into that, to draw further attention to this meaningless feature. Have also seen more than one parking – scraped example, where the plastic bits have departed, leaving a row of square holes in the door panel, where the retaining clips were. From which, it might seem that the only functional effect of this feature, is to provide starting places for rust ? There is of course no question that the Clio is blighted by several instances of design over functionality, as outlined above, but surely Renault deserves some credit for producing an attractive looking car – in the case of the Sport Tourer, a very attractive looking car. Hi Richard (Herriott), are you referring to the battered Clio or the Marina? Hi Eóin, yes, the new Polo absolutely does not improve with familiarity. It manages to be utterly banal and hugely overwrought at the same time. This combination is quite an achievement in one design. What is it with VAG and trapezia and other irregular geometric shapes these days? These used to be the preserve of Lamborghini, but are now indiscriminately applied everywhere. That double crease on the side of the Polo is there to force the panel to have a sharp boundary. It is rather overdone, in my view. It is very much pure styling and something of an unusual move from a car maker like VW. The Clio´s appearance does not disturb me. Really, it is a rather spacey and individual design which does not look like anything else on the road. Eoin didn´t like the interior – I seem to recall that I did like the very same trapezoid holding the central screen. Richard, I found it via Google. Having re-run my search, I discovered that this fine image is your excellent work, first published on the DTW website on 28th June 2015. I should have recognised the streetscape by now! Apologies for failing to credit you. No problem. I thought it looked familiar! It has disappeared from my district. Like the pre-facelift Punto discussed recently, the Clio has aged well. It’s definitely form over function, but it’s a nice form and I always like looking at one. The estate is really lovely, like a mini 156 SW and it’s a big shame it never came to the UK. I think I am in a minority here in being a fan of the 156 WITH the hidden rear door handle – it serves to highlight the single, chromed, elegant traditional item attached to the front door and the leaves elegantly clear and beautifully arced flanks. I didn´t know the SportsTourer did not come to the UK. How odd. The 156 door handle was a nice conceit which did not need to be repeated. At least on my 156s the front door handles were anodised semi-matte aluminium which was much more pleasant haptically than the 147’s chromed items. I also liked the trad push button operation instead of the pull-out handles. They should not have repeated this door handle game nor should anybody else have copied it. It doesn’t take much to make it (almost) desirable. Yes, it is a bit better. I´ve messed with the Lancia Kappa and Citroen XM. As I see it, a coupe is a lot more than new front doors. The whole car has to hang together and so all the panels need to be altered in comparison to the saloon. The only bits that can be retained are the drivetrains and suspension elements, the dashboard and maybe the front seats. Any coupe that is the saloon minus two doors will look odd. Original door, shortened rear side glass and enlarged vent. I’ll stop now, before I give the impression of being obsessed with the Morris Marina. What? Too late? Doh! Was there not a 60’s or 70’s Lancia or Alfa Romeo with hidden door handles? I recall seeing such an image on DTW site but I can’t find the link any more. Something to do with Lincoln Continental perhaps? The Clio is nice but the Loire is nicer. Did you manage to see any chateaux or take a river trip whilst in the area? I have many happy memories of chateau touring and in between tours seeing the battered Clio’s (and just about every other car) of about ten year ago. The modern Clio makes a great touring car support series but they too seem to have difficulty seeing out of the front, side, rear…. Sadly, no. It was very much a ‘splash and dash’ kind of trip, so it was all a bit of a blur. The bits of the Loire I could see from the confines of the Clio’s cabin however looked very pleasant indeed. I ardently wished I had brought my bike.